West Nile Virus Complete Set includes West Nile Virus Complex #1 and West Nile Virus Complex #2. West Nile Virus Set can be used for humans or animals. Regular $23 per bottle, a $46 value. Save 22% when purchased as a set. West Nile Virus Complex #1 includes the 3 strains of West Nile: West Nile Virus, St. Louis Encephalitis, and California Encephalitis. All 3 strains are in a 6C health protection potency. West Nile Virus Complex #2 includes the 3 strains of West Nile: West Nile Virus, St. Louis Encephalitis, and California Encephalitis in a potency homaccord, also referred to as a F or forte potency, that includes 30C and 200C potency for symptoms. Remedies Baptisia and Gelsemium are included for symptoms of West Nile. 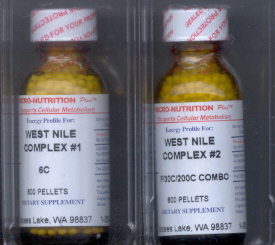 For protection and treatment of symptoms: West Nile Complex #1 and West Nile Complex #2 are used together; or alternate West Nile Complex #1 5 pellets one day with West Nile Complex #2 5 pellets the next day. For general health and to stimulate the system in a protection protocol, regular use is needed. Suggested dosing: 5 pellets West Nile Complex #1 and West Nile Complex #2 once weekly. Our West Nile Virus Set is offered for emergency preparedness. West Nile Virus Set is a must for horses. Horses are at risk for West Nile Viruses partly due to suppressed immune systems and over vaccinations. Suggested protection dose for horses is 10 pellets every day for 2 weeks with follow up regular dosing weekly to keep a response in the body. Suggested treatment dosing for horses is 10 pellets twice daily of both products using your preferred medication method. Continue for 1 month or until contagion period is over and animal/person recovers. Homeopathy remedies (nosodes) formulated for exposure to bacterial & viral agents. Homeopathic Nosodes are safe without even a whole molecule of the actual substance.